The Intex 4 Person Octagonal Spa is a good choice for anyone who wants a top quality Budget inflatable hot tub that stands out from the rest. It’s especially great for those who prefer to nestle back into a corner when they relax in a hot tub. Because with this model, you get eight corners to choose from! Just like the square hot tubs that are becoming more popular these days, hot tub owners are finding that the corners offer more back support than the round models. If you’re like us and suffer from back problems, this is a really useful feature. With its innovative eight-sided shape, this portable spa is certainly a new way of looking at inflatable hot tubs. Add in the cool gray-and-white design, and you have a hot tub that looks fantastic, and performs to the highest of standards. What’s also good about this hot tub, is that at 79 inches across and 28 inches deep, the Intex Octagonal Spa really is large enough to comfortably seat 4 adults, aided by its unique shape, which means that everyone can have a corner to themselves. And with 120 high-powered air jets bubbling away, everyone is going to get a great all-over massage as well. Of course, with 2 people in it, the tub offers plenty of room to stretch out and relax. To check out the current price on this unique tub, it’s worth heading over to Amazon where there are some great deals. Just make sure your deal includes free postage! To help you see exactly what you get in this hot tub, we have put together a table which shows you all the features and specifications, as well as compares it to similar-sized budget hot tubs. 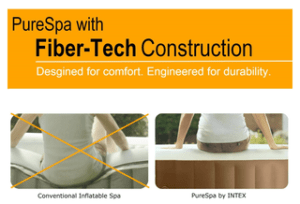 The Intex Corporation make a range of leisure goods, including airbeds and above-ground pools. They are also known for making extra-large hot tubs that consistently get good reviews. We’re pleased to see that with the Intex Octagonal Spa they have made a good quality, high performance hot tub. At 79 inches across and 28 inches deep, it is one of the biggest Budget models you can buy. And, because of its unusual shape, you really can get 4 adults in, all sitting down, without anyone feeling too cramped. That’s because the corners give you more floor space than a traditional round hot tub. Its shape also makes it a good choice for a small family. It’s made with a Fiber-Tech internal construction, which are strong but flexible vertical mesh panels inside the wall of the hot tub. The hot tub is then covered with an extra-thick, triple-ply laminated PVC skin. This makes the Intex Octagonal Spa strong enough to withstand everyday wear and tear but its flexibility keeps it comfortable to relax in when you lean back against the sides. It also means that adults can sit on the side of the hot tub without the walls giving way or buckling. This is useful to know for anyone who is a little unsteady on their feet, and who is looking for an inflatable hot tub that will support them as they get in and out of the spa. 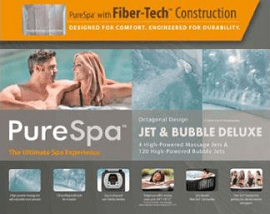 Around the bottom of the hot tub, there is a ring of 120 bubble air jets, which give a powerful massage. This system is controlled by the digital control box which sits on the side of the hot tub, so you don’t have to get out of the spa to control the massage system or the water heater. Intex always include a Hard Water Treatment System in their hot tubs. This uses electro-magnets to agitate the calcium which is found in hard water. The calcium then forms into minute crystals which are filtered out by the hot tub’s filtration system. By removing the calcium in this way, the system prevents the build up of calcium deposits on the working parts of the hot tub, and helps to prolong its working life. As an added bonus, it also helps keep your skin nice and soft! 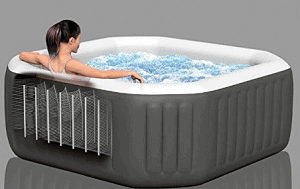 The Intex 4 Person Octagonal Spa is a plug-and-play model. This means it is super-easy to set up, and doesn’t require any special skills or tools. To start with, you need to choose a flat space where you are going to site your hot tub. The Intex 4 Person Octagonal Spa measures over 6 feet across. With a round hot tub, you’d need an area at least ten feet square. But because of its octagonal shape, you will be able to tuck the spa into a corner of your yard, room, or decking, as long as you leave a little access around the spa. Of course, if you want to have it in a more open space, it’s going to look great as well, making a real feature of your garden or room. Talking of putting your Intex 4 Person Octagonal Spa on a deck. When it’s full, this hot tub weighs around 1,800 lbs. Add in the weight of the people who are going to use the hot tub, and you are looking at a total weight in excess of 2,000 lbs. Therefore, you need to make sure your deck can hold that kind of weight. When you have chosen your site, lay out the thermal ground mat, then lay out the hot tub on top. Attach the inflator hose to the hot tub and the inflator, and it will take about 10 minutes to inflate. Once the hot tub is inflated, close the air valve, and attach the digital control panel on the side of the spa. Before you fill the hot tub with water, make sure you are completely happy with the position of the hot tub. There are useful grab handles on the side of the tub which let you shift it into place. Now fill the hot tub with water, using an ordinary garden hose. It should take about half an hour to fill the spa. We always recommend filling it to the minimum mark inside the spa, the first time you use your hot tub. This lets you see how much the water rises when everyone is in the spa, and prevents the water overflowing. When you have filled the spa, put on the cover and turn on the water heater. It will take up to 24 hours to heat the water up to the maximum temperature of 104F. If you can’t wait that long, we recommend filling your spa with hot water. This will cut down on waiting time, and also reduce heating costs. With the water at your preferred temperature, it’s time to get into the spa. Remove the cover and slip into the hot waters. If you have children who want to get into the hot tub with you, make sure they are of a suitable age and height. For more information on this, check out our article on Keeping Children Safe In Your Inflatable hot Tub (opens in a new tab). When you are settled back in the waters, it is simply a matter of reaching out and turning on the massage system when you wish. You will find that running the massage system for any length of time does cool the water, so you need to turn the water heater on to get it back to maximum temperature. Once you have finished in the hot tub, remember to put the cover back on. This keeps the heat in, and helps keep heating costs down. Remember to lock the cover as well, to prevent children getting in when you’re not around. The Intex 4 Person Octagonal Spa is an impressive inflatable hot tub. We love the unique design, as well as the fact it is such a large hot tub. The extra inches of width and depth mean there is more than enough room for 2-3 adults to stretch out and enjoy the experience without feeling they are on top of each other. Its shape also makes it a great place for socialising. The one downside, however, is the lack of a cushioned floor. It doesn’t make the hot tub experience uncomfortable. However we wish that Intex had gone the extra mile and included a padded floor, such as you find in models such as the SaluSpa Siena. That said, you can pick up cushioned seats very cheaply online. So don’t be put off if you have your heart set on this model. Its advantages easily outweigh this one downside. Who Should Buy The Intex 4 Person Octagonal Spa? A good place to buy your hot tub from is over on Amazon, where they have the best deals including free shipping. With such a heavy item, we really have come to appreciate saving on expensive shipping costs and the added bonus of having it delivered to our door without having to cart it across town. To see the latest deal on Amazon you can click on this link. All images © Intex Corporation. 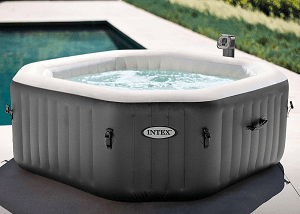 Tagged inflatable hot tub reviews, inflatable hot tubs, Intex 4 Person Octagonal Spa Review, intex inflatable hot tub.